Examine performance limiters to unleash your application. and where shader cycles are spent. counters, utilization, draw call counts, or other metrics. Perform experiments to discover targeted optimization opportunities. Analyze simultaneous compute and graphics. workloads that limit your performance. DXR Debugging enables the next generation of real-time rendering technology. Scrub your RT scene and see render-target revisions. Reduce the complexity of development by visualizing shaders and key inputs. 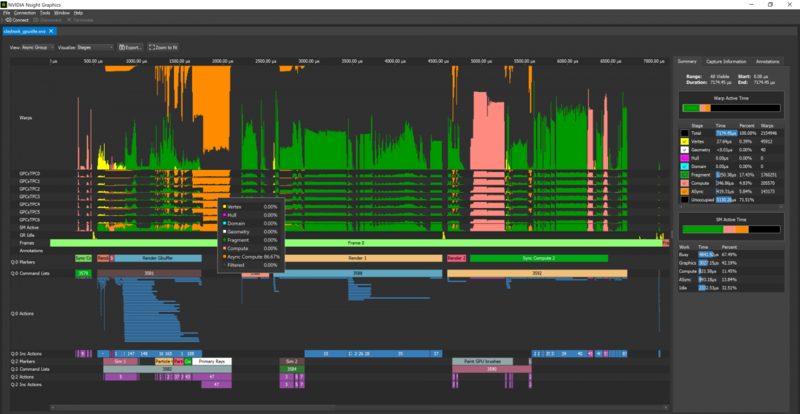 NVIDIA® Nsight™ Graphics is a standalone developer tool that enables you to debug, profile, and export frames built with Direct3D (11, 12, DXR), Vulkan (1.1, NV Vulkan Ray Tracing Extension), OpenGL, OpenVR, and the Oculus SDK. Access the latest announcements, early release candidate access, file bugs, event invites and more. Sign up today!